"When Anne Lamott was twenty-five, her father died after a long struggle with brain cancer. Over the next few years she herself began to suffer from an overwhelming sense of desperation and fear which she tried to suppress with alcohol and pills. Although she was managing to write and publish successful novels at the time, it was clear that her life was spinning out of control. 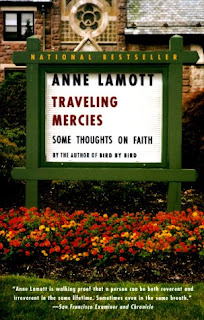 In Traveling Mercies, a memoir that sparkles with wry wit and compassion, she now writes about this dark period of her life, and of her turn--to her own great surprise--to the community of Christian faith and love she found in a neighborhood church called St. Andrew. I did not enjoy this book as much as I thought I would. Lamott definitely seems like my kind of person...rebellious, edgy, weird...and I thought I would like her take on faith. Sometimes I did but most of the time I was just depressed by the circumstances of her life. See, this is why I read fiction...to escape all that. I get a dose of real life every day and I find it refreshing to escape into movies, reading, my art, etc. Especially right before bed (when I read) because it allows me to shut down my brain and actually go to sleep. So, no more non-fiction before bed. I want to sleep, not think. Hmmm. I really thought you would like this. But I understand your point.